The well-known French paediatrician Patricia Le Roux ventures in this book into the virtually unknown territory of butterfly remedies in homeopathy. She has found these remedies particularly useful among hyperactive (ADHD) children who are lively, agitated, restless and mercurial. In these “butterfly children”, there is often a strong feeling of being abandoned, especially by their father or mother, which is experienced as loss of imposed authority and safe boundaries. Butterfly remedies also have a common theme of metamorphosis – the desire to dress up. They enjoy masks and are confused about their own identity. The author has found these remedies very effective too in various skin problems, such as urticaria or eczema. The book contains provings, cases and concise essences of 13 butterfly and moth remedies: The California Sister, The Tailed Jay, The Lilac Beauty, The Processional Caterpillar, The Brown Tail Moth, The Brimstone, The Death’s Head Hawkmoth, The Blue Morpho, The European Peacock, The Marsh Fritillary, The Cabbage White, The Small Tortoiseshell and The Fox Moth. These different remedies are clearly differentiated and vividly described, paving the way for exciting new prescription possibilities. “A wonderful small book by one of our best homeopathic explorers. This is indeed an innovative ground-breaking new book which I heartily recommend. It is attractive, well-bound, and good value for money. It grabbed my interest from the start. I have started with my verdict in order to grab your interest; now I shall describe the book. Thirteen provings are discussed, preceded by an excellent description of the theoretical and practical issues involved in provings, and a frank admission that not all those in this volume live up to best practice. There is an essay on the natural butterfly world, and a summary of butterfly symptoms such as abandonment, metamorphosis, trans-sexuality, butterfly dreams, genetic problems, reduced mental agility. There are short chapters on a paediatric case and materia medica for each butterfly. While reading the book I kept reaching for a dictionary, for materia medica, for my repertory. Even though I am sure I miss some, I cannot help but notice errors, which should have been found at the proof stage. 'Desensibilisation' is a new aspect of the confusion between the English and French meanings of sensible and sensitive. Alimentary we know means dietary but not in English usage for a food craving. I could not identify 'oneiric'. There were more neologisms and mistakes. I was confused and muddled by the separation between the description of each proving and the corresponding case and materia medica, even with the help of a ribbon bookmark. More important than these failings, minor but irritating, is the brevity of the provings, many of them dream provings, and the subsequent reliance on them with the briefest of explanations for cases with such problems as torsion of the testes (named 'tension') with Bombyx processionaria. The bibliography is inadequate in that modern or classical provers are named, but their source publication is not listed. Murphy is cited as a source for Bombyx-p but the original source is a short French proving quoted in TF Allen. KJ Miiller proved Apdra syrinagaria but is not cited in the bibliography. On the other hand the cases are elegant and simple. Pieris brassica is (of course) the Cabbage White. The little girl patient with urticaria loved to dress up (in white) as a fairy (metamorphosis), pretended to fly (butterfly), she had been abandoned by her father, and her alimentary preference was cabbage. The result was happiness. I was delighted to read this book through at one sitting. 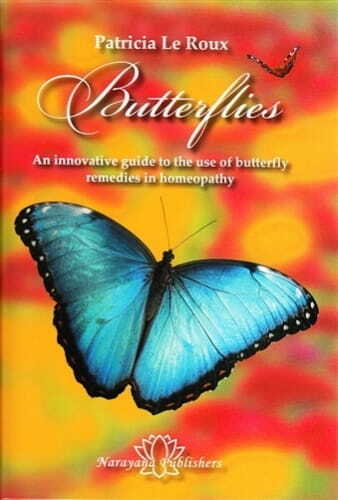 Butterflies is the most recent book by French paediatrician Patricia Le Roux who first began studying butterfly as remedy in Marseilles c. 2001. Her inspiration to pur­sue this field came from Indian homeopath Chetna Shukla and Dutch homeopath Jean Pierre Jansen. This work, which discusses five moths and eight butterflies, is the cul­mination of her labours up until now. The book is divided into four sections: char­acteristics of the butterfly world, the provings, summary of symptoms common to all butterflies and main butterfly case studies and materia medica. It is this last section which forms the bulk of the book. In the provings section Le Roux outlines the methods which range from toxicological information to meditative provings. Nearly all the provings are very small and thus her caveat"... that the following information is only minimal and calls for verification. This is only the beginning of a collection of data that can open the door to prescribing such remedies." This is true and actually the only proving of note is the 1991 one she cites by Didier Grandgeorge on Bombyx proces-sionaria (The Processional Caterpillar). De­spite the paucity of information from which this book suffers this section does make for interesting reading. The theme of "autocastration" came up with this remedy and was particularly relevant to one of the provers. Other themes which emerged for this rem­edy include "feeling under attack", "dreams of being cured", "feels as if going mad", and "feels pointed at". Later, in the materia medica section, Le Roux sums up the reme­dy in three themes: feelings of abandon­ment, remedy for twisted testicle and self-castration, and urticaria. She also includes material from Robin Murphy's materia. References she mentions include K.J. Muller, N. Herrick, S. Kohlrausch, and C. N. Shukla's Sieben Schmetterlinge. Die hombopathishen Prufungen (1998; Seven butterflies. The homeopathic provings; not available in English), Shukla's "The Tailed Jay, a case and a proving of Graphium agamemnon" (Homoeopathic Links 2001; Vol. 14;1), Grandgeorge's "Proving Bombyx processionaria", Ecole Hahnemanienne de Frejus, 1990, and J.P.Jansen's "A Guide to the Muse, a case of Apeira syringeria" (Homoeopathic Links 2001). This work is certainly incomplete and in need of much more information, but until we get more this reference will have to do. The nice thing is, is that this book is a work of art, stunning and beautifully produced.